Although I've been involved in technical pursuits for about a decade and a half, I haven't really been following Apple that long, rather only after being completely won over by my first Mac, a PowerBook G4, in late 2002. Since then, I've not only converted my entire hardware platform to Apple's, but now develop software and support hardware across a range of Apple devices and operating systems. I mention all of this as a bit of background for my thinking on the topic of the tablet. The lion's share of my livelihood is made in the Apple ecosystem, but, as again should be no surprise to the Apple faithful, I'd rather not work in technology than have to use the crap the rest of the industry is churning out lately. With the conventional "wisdom" that Apple's lack of presence in the netbook market was hurting them financially now being replaced by an unprecedented stock run-up in response to the latest round of tablet rumors, it seems all the world is now awaiting Apple's announcement of a new platform -- the new platform. Speculation on the tablet really picked up late last summer in advance of Apple's September iPod event which turned out, unsurprisingly, to have to do with new iPods. Then late in the year, only a few weeks ago, things climbed to a fever pitch. People love their Macs, they love their iPods, and they love their iPhones. They want to know what the next great thing is that they are going to love, because in a world of crappy technology, people love to love good technology. But that doesn't necessarily mean that Apple's next game-changing product announcement is going to happen at the next opportunity that they have to announce something. There are two things that we should be learning from the cycles that Apple continually operates on. Apple is pretty much the de facto innovator in the industry now. It's Apple's job to figure out what to do next, figure out how to accomplish it, and help people evaluate whether it's someplace that they want to go (though, unsurprisingly, they tend to lean hard on "yes, it is"). 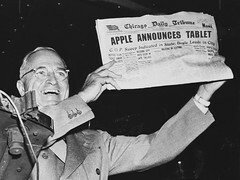 But you can bet the tablet will exemplify Apple's modus operandi -- to truly reinvent. Other companies are hesitant or unwilling to do this for all of the standard reasons -- it's too costly, too risky, too hard to manage, requires the best people, and requires a strong-arm approach to both secrecy and hardware component vendor relationships. The second thing we should be picking up is that because of the lengths to which Apple is willing to go to reinvent, the armchair pundit is usually at a loss when trying to map this near future. When the iPod is an unprecedented success and rumors of an Apple entry into the cell phone market bubble up, concept illustrations emerge of a phone with a scroll wheel. Touch-screen? Never saw it coming. When the iPhone 3G is an unprecedented success, yet not quite everyone has one, it is assumed that Apple's next generation of the device (what turned out to be the 3GS) would have to be in the sub-$100 range. Apple both released a new and desirable next generation model, as well as appeased the $99 crowd with a base model of the previous generation, growing their reach. It is still unclear exactly what an Apple tablet would include, but most observers expect a sort of large-scale iPhone that has additional features for viewing video and reading books and magazines. Yes, because what people want is a bundle of features with an Apple logo on it. Tell me again, what are the features of your iPhone? Now, tell me what apps you use. He said the plastic back panel of the phone could have a touch-sensitive solid shell, much like on the Magic Mouse. Some imagination please, people? And it could include an updated version of the iPhone operating system? You, sir, are why we can't have nice things. The Thing About The "Latest Creation"
Apple's next media event has been announced, confirming the January 27 rumors seen in the past couple weeks. The so-called tablet device in progress by Apple will not be announced at the January 27 media event. The idea of "creation", something that the industry as a whole frequently puts out of the spotlight to play second fiddle to "management", is to be applauded. We need more companies embracing Apple's vision of a creator in the digital space and less of a consumer and manager of the stuff that is already out there. And the image of paint splatters, colorful and very tactile, is evocative of using your hands on a canvas. Much like the more evolutionarily-programmed need and desire to see human faces in inanimate objects, we want to see this relate to the tablet, which we want to see be a natural extension of a touch-based interface like the iPhone. But the world isn't hooked into visual, even tactilely visual, creation in the same way that we are hooked into music and communication. And I don't see Apple taking us there -- at least not as a next step. 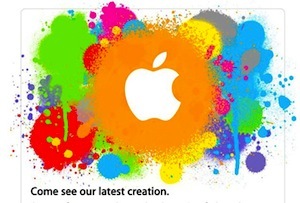 Another interpretation of the paint-and-creation motif (props to Brandon Sneed for this one) is to supplant the iPod. The bright colors represent the brightly colored iPods of yore. Anyone can see that the scroll-wheel iPod is being phased out -- face it, anything that Apple brands as "Classic" is on its way out. My money's on something non-tablet in the announcement, more along the lines of a more-than-iPod-but-less-than-iPhone device. But about the only thing that we can be sure of is that Apple's stock is going to go down next week due to the rampant bursting of bubbles. So now what, Tough Guy? So what is coming out next week? If I knew that, I'd probably be writing for bigger and better publications than my own blog (or possibly getting a cease-and-desist nastygram from Apple). I don't put the time into obtaining and cultivating original sources, something that tech punditry needs more of, and something that true indie journalists such as John Gruber of Daring Fireball do. So I'm basing this speculation on my own understanding of the past combined with references from publications that I do trust who have sources on the ground. The September 30, 2005 filing (published today) is titled "Proximity detector in handheld device." It describes a touch-screen interface for portable electronics devices that can sense when an object, such as a person's finger, is approaching. When an object is sensed, the touch-screen interface may perform an action such as displaying a "virtual scroll wheel," navigation pad or virtual keypad. Not just touch, like the iPhone interface, and not just proximity, like the auto-dim when putting the iPhone to your ear, but an interface that changes based on your finger's proximity. Just one of many Apple multitouch patents. And just one of many things to keep us watching, to be sure. See you next Wednesday. I'm please to announce the immediate availability of Meerkat 1.5! The best Meerkat release yet, Meerkat 1.5 features a number of under-the-hood improvements, as well as a complete visual overhaul in the user interface. I'd like to take a moment to highlight some of the most useful changes. 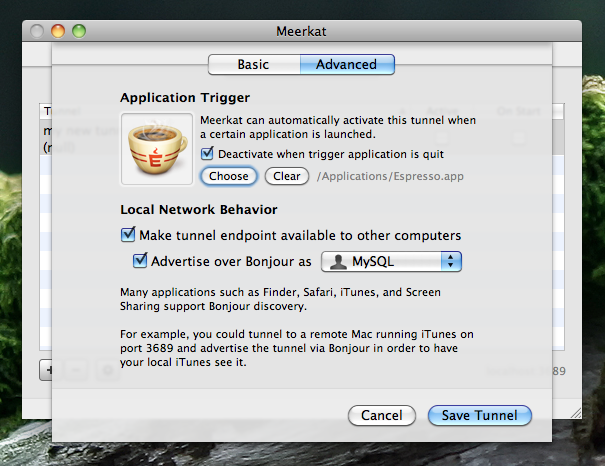 At the top of the list is a long-requested feature: automatic retry of tunnels. While Meerkat already automatically reconnects tunnels when you change networks, sleep and wake your Mac, or have an interruption in connectivity, now Meerkat takes this a step further. 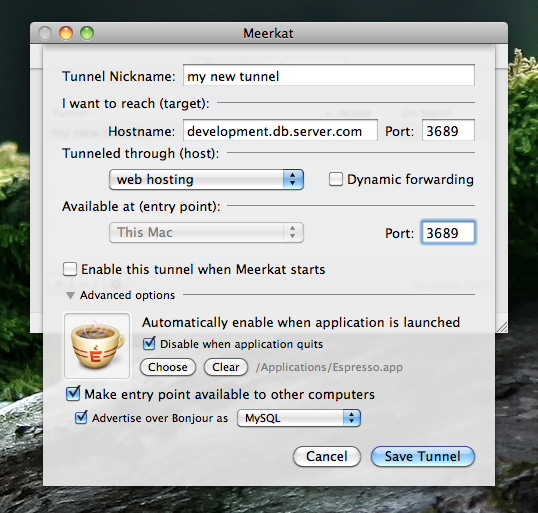 A tunnel is retried at increasing intervals, so a minor network hiccup won't require your attention if the tunnel can't connect on the first try. In fact, if you eventually get an internet connection and if the server is up, you should likely never see the error dialog again. 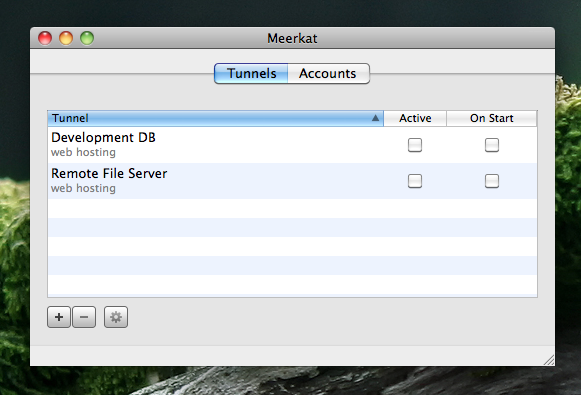 Meerkat works tirelessly behind the scenes to keep your tunnels up and running. 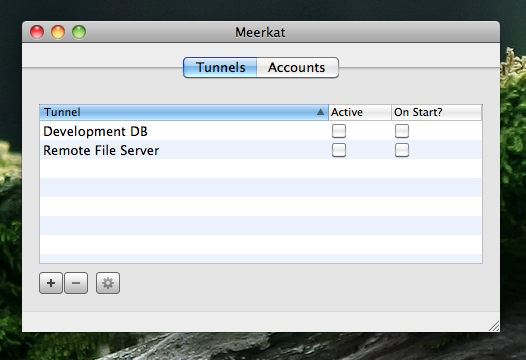 What's more, a quick glance at either the main window or the menu bar will let you know if Meerkat is working on getting a tunnel back online. Another solid improvement in Meerkat 1.5 is much better error reporting when there is an immediate connection problem. If your server is down, you forgot to turn SSH back on, or there is a password problem, Meerkat will tell you exactly where SSH is having the problem. And if a password no longer works, Meerkat will automatically remove it from your keychain so that you can be prompted for the new one, optionally saving it back into the keychain for future use. Combined with Meerkat's existing strengths in allowing you to choose which passwords stay in the keychain and which exist only in your head, as well as effortless SSH agent integration, all of your authentication needs should be covered. 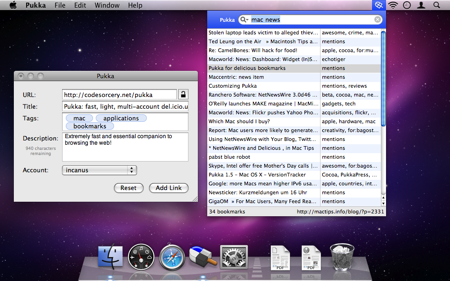 Most visibly, Meerkat 1.5 has been given a big facelift. Each element of the main user interface was scrutinized, tiny tweaks were made here and there, and we think the results speak for themselves. There is a more pleasing balance to the main window while providing a bit more info. 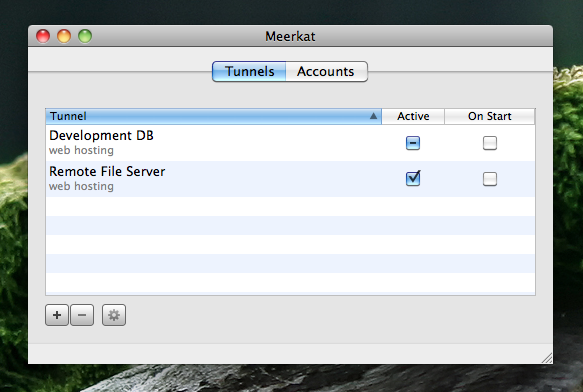 A more dramatic change is seen in the tunnel editing. What was once one panel with a disclosure view for advanced options is now two tabs, again lending a more balanced look while being clearer to read at a glance and more pleasing to the eye. There are many other niceties to be found under the hood of Meerkat 1.5. 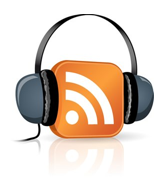 We've put a lot of work into both requested features as well as unrequested tweaks that we feel are big improvements. In addition, Meerkat's product page features a slew of short, one-minute screencasts highlighting Meerkat's main features. And as always, Meerkat features a 14-day unrestricted trial, so why not download Meerkat now? As a final note, I just wanted to say thanks to both our software customers as well as our clients. Code Sorcery Workshop has recently celebrated three years as a business. Every day is still new and exciting and better than the last. I look forward to another three years -- and beyond -- providing software and services to people around the world. Thank you.